The diverse studies presented in this volume recount the production, understanding and organisation of Muslim literature, both in the Muslim world and Western Europe. 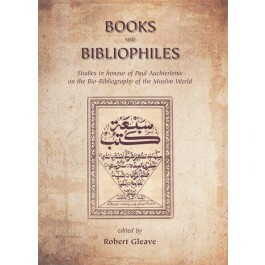 First, there are bio-bibliographical studies of Middle Eastern and Muslim literature, in which contributors examine texts and their interrelations in a series of discrete studies, demonstrating how bio-bibliography is reliant on the resources devised and maintained by librarians. Recurrent themes include the vexed question of “authorship”; extant books, tracts or reports are attributed to particular authors, but their content, at times, seems to indicate an alternative author. In the second section, the focus is on the advancement of the study of this literary heritage outside of the Muslim world, primarily in Western Europe. These studies describe the processes and individuals within the development of the western study of the Islamicate world and reflect some of the interests of Paul Auchterlonie, to whom the volume is dedicated. 2. Ronald Buckley (University of Manchester), "The Works attributed to JaÝfar al-ÑÁdiq"
3.1 Saud Al-Sarhan (University of Exeter) "The Creeds of AÎmad Ibn Íanbal"
4. Sajjad Rizvi (University of Exeter), "The literary anthologies of Sayyid NiÝmatullÁh al-JazÁÞirÐ"